The word Gulbarga came from the Persian language where gul means flower and berg mean leaf. It has been under the dominance of Bahmani Dynasty for very long and also served as the capital of this kingdom. One can observe varied styles of architecture patterns in Gulbarga which make it valuable for historians. Also, two main rivers namely Bhima and Krishna flow in the city making the land fire for agriculture purpose. Gulbarga reveals speckled forms of art and culture. It seems like everybody who ever ruled this place left the mark of their existence in this city especially Bahmani’s. The place is on the priority list of the tourists and every year there is a huge crowd traveling here to witness the spectacular and assorted form of art. The holy places are engraved with quotes from the respective religion. The paintings inside the monuments are all different and new since they all came directly from the imagination of the artist. There are many mouth-watering dishes cooked here namely Tahari, Jolada Roti and Bele Hoorana Holige. The last one is the native sweet of the town that is cooked during every occasion. This town is indeed a bliss for tourists. The town is an attractive place and tourists in large numbers visit here to experience what it is like to be at Gulbarga. Below are a few places near the town that are also worth visiting. It is the tomb of the Sufi Saint, Khwaja Syed Mohammad Gesu Daraz. The architecture of the Dargah is of Indo- Saracenic style. Most of the parts of the Dargah like the walls, domes etc are an inspiration from the Bahmani. People here have a deep faith in this Dargah that cannot be shaken. The Fort is amongst the top tourist attraction in the place. The fort portrays Islamic style of architecture. It was built by Raja Gulchand and was later fortified during the reign of Bahamani Dynasty. 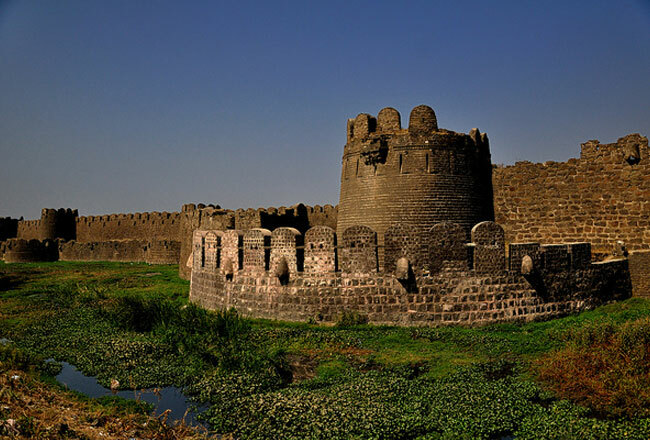 Alauddin Bahman equipped the fort after the town was declared as the capital of Bahamani Kingdom. This Masjid was built by Mohammad Bahmani in 1367 and is amongst the oldest Masjids present in Southern India. It was developed to honor the declaration of the town to be the capital of Bahmani. The Masjid is decorated beautifully and is present in an area of Gulbarga Fort itself. The temple is dedicated to Shri Sharana Basaveshwara who was a great Hindu philosopher and also a wise religious teacher. It is situated in an old town of Kalburgi. The philosopher was popular for Dasoha and Kayak philosophy and was a Lingayat saint. Jevargi is located on the banks of Bhima River. It is popular pilgrim center of Jain community and there exists many Jain Basadis also. Jevargi is almost 40km away from Gulbarga. Jains in large number flock here during their festivals. This dam is constructed around 120km away from the town. River Krishna gushes down here and is commonly called as Jaladurga Falls. The view of flowing water is in itself source of serenity. The overall scenic beauty is also marvelous. It is the largest Buddhist site in Karnataka which makes it really important from the archaeological point of view. It was built in the 11th century and is now referred as Chandralamba Temple. Devotees visit this place with great hope and faith. Reaching the town is a trouble-free journey as it provides good connectivity. The airport is under construction, therefore no direct flights to Gulbarga. The nearest airport is around 81km away from Gulbarga in Sholapur. Hyderabad International Airport is another airport which is 220km away. Hyderabad is finely connected with the major cities and hence, it is easy to fly here. You can opt for train or buses for the journey to Gulbarga from here. The town has a wide network of trains across all the main cities of India. One can reach Gulbarga via train with great ease. The journey all through to the town is comfortable by train. Railway is indeed the lifeline of India. Another railway station at Gulbarga is under operation and will soon be ready. There are many public and private buses running on the regular basis to the town . The fair is reasonable and tourists experience a smooth journey. There is a strong connectivity of buses across the major parts of India so that tourist can easily board the buses and visit the place.